Graph attached explains a big problem pretty clearly. Half of our citizens aren’t working in Louisiana. 600,000 have no high school diploma. To help them become employable is a win-win for all. Thanks to Northshore Community College and Technical School for sharing this info and working everyday to build Louisiana’s future. That half the state’s population isn’t in the workforce is a colossal problem. 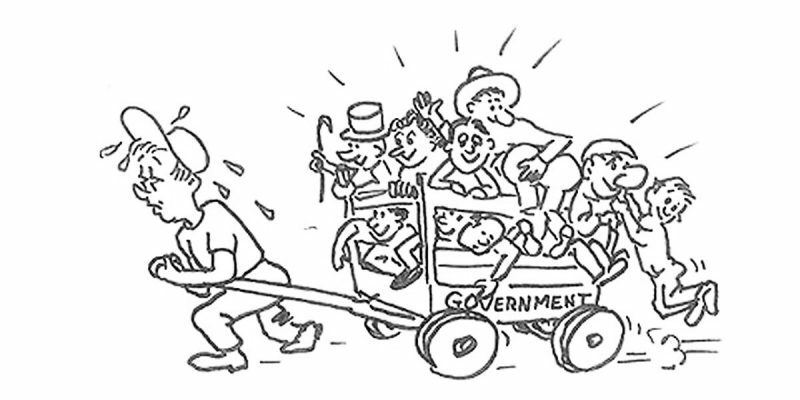 You have as many people riding in the wagon as you have pulling it, and that’s a good way for the wagon to move incredibly slowly. People who aren’t in the workforce fit into several categories. For one thing, children aren’t going to be in the workforce. 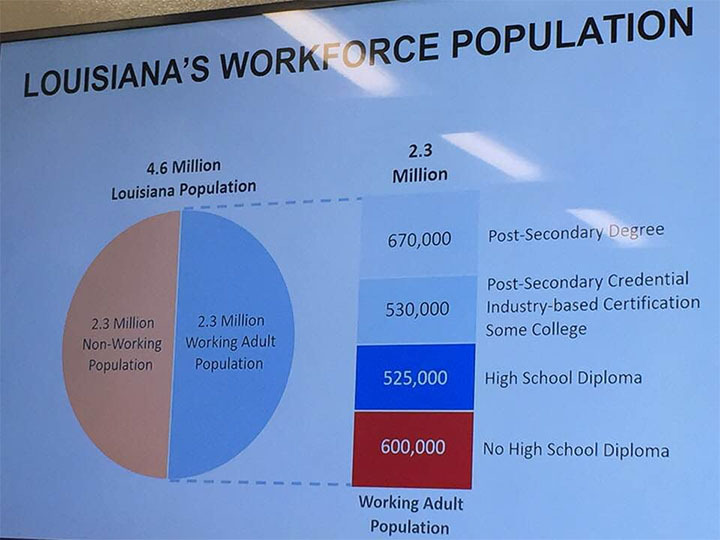 According to 2016 census estimates, 23.8 percent of Louisiana’s 4.68 million people are under the age of 18; while there are some 16- and 17-year olds in the workforce, we’ll assume that’s a negligible number and call it about 1.1 million school children not in our workforce. And then there are 14.4 percent of Louisianans who are 65 or over. Now, there are more people older than 65 who are still in the workforce than there are school-age kids, so let’s shave that 14.4 percent down to 11 percent. That would be another 510,000 people. Which leaves about 700,000 Louisianans between 18 and 65 who are not in the workforce. That’s a number about half the population of the greater New Orleans area, and they’re not working. Some of those are married women who aren’t in the workforce, and there’s nothing societally wrong with that by any means. But if you look at Louisiana’s unwed childbirth rate, you’ll know that isn’t what’s driving the 700,000. The census estimate says some 11 percent of Louisianans under 65 are living with a disability. That’s over 500,000 people in this state who are claiming to be disabled. Some of those are in the workforce; most, we assume, are not. There’s a substantial chunk of your 700,000. How many of those people are really disabled, and how many of them just figured out how to work the system to get a check? We don’t want to cast aspersions on disabled people, but let’s be honest – everybody knows there is a mountain of abuse when it comes to the Social Security disability program. The point is, before you even get to the fact Louisiana has a structurally deficient labor force from an educational standpoint and our state’s public education system is clearly failing us by not turning out enough high school graduates capable of doing productive work, you realize Louisiana is behind the eight ball in terms of our state’s citizens fully buying in to a well-functioning society. Yes, the wagon is heavy to pull. It’s packed with people.